Our story, full of unexpected twists and turns, started in 1988. As is usual in a love story, we had no idea what we were walking into. But the Savigny family, François, Muriele, Simon, Serge and Colin jumped head first into an adventure that was supposed to last only a few years. Just the time necessary to restore the lovely old Château that had long been abandoned by the previous owners. After 15 years of major work, carried out meticulously by the family members, the Château was opened to the public for seminars and marriages. The grand old building could finally return to it roots as a place for meetings and shared moments. The Château is ideally situated midway between Grenoble and Chambéry, just five minutes from the nearest highway exit, and yet protected from the urban stress and agitation. The setting is perfect for meetings and peaceful moments. For receptions and larger events, family reunions, etc., the gallery is available, offering a full 140 square metres of space, enough to seat 120 people. 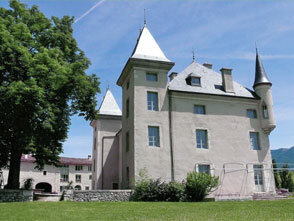 Situated on the ground floor, it opens directly onto the courtyard of the Château.